According to the business resource, the impact of more countries taking a similar approach to the dollar could be problematic, with the US' European partners, including France, Poland and Hungary, already engaged in similar gold buys or referring to their dependence on the dollar "an issue of sovereignty." For Russia, Bloomberg suggested, the gold stockpile means safety "against geopolitical shocks and the threat of tougher US sanctions as relations between the two powers continue to deteriorate." However, with Russian gold mines' output topping out at about 300 tonnes per year, and the Central Bank buying up nearly 275 tonnes of that in 2018, Russia is on-course to making substantial purchases abroad, according to observers. "Should it reach the limit for domestic purchases, I think the Central Bank will start to import gold," Oleg Kouzmin, chief economist at the Moscow-based brokerage firm Renaissance Capital, said. According to the economist, continued tensions with Washington mean that Russia's bullion reserves will keep growing as a percentage of total reserves. Gold already accounts for close to 20 percent of Russia's total foreign-exchange reserves, with the dollar dropping from a whopping 46 percent of reserves in mid-2017 to 22 percent now. The remaining dollar cushion is accounted for by Russia's continued dependence on the greenback for international trade. 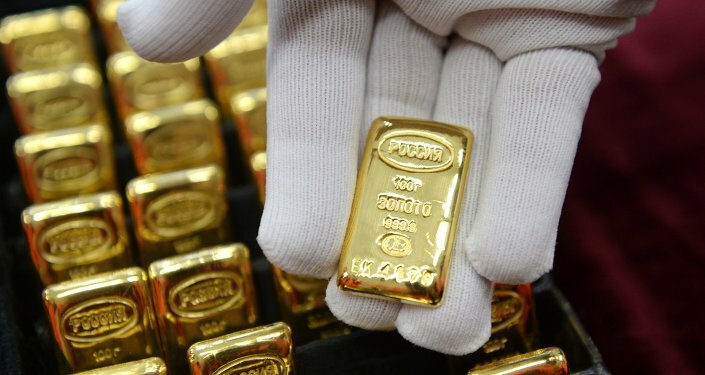 Ronald-Peter Stoeferle, a managing partner at Liechtenstein-based investment firm Incrementum AG, said that Russia's gold bonanza has helped prop up global gold prices substantially in recent years, with prices jumping by over 20 percent since 2016 and going for roughly $1,300 per ounce in Friday trading. In 2018, Russia accounted for a whopping 40 percent of total gold purchased by central banks, with its purchases accounting for some 6 percent of total global buying. And that strategy has already brought dividends, according to experts. Last month, economists estimated that the Russian Central Bank has already earned somewhere in the neighbourhood of $10 billion dollars thanks to rising prices for its gold holdings. Economist added, however, that the rising dollar value of the gold was just a bonus, since the Central Bank's main purpose was to diversify reserves and insure them against the threat of Western sanctions.